For the first time, scientists and trained volunteers onboard the conservation charity's specialized research yacht Silurian will use an Automatic Identification System (AIS) transponder to collect detailed data on other vessels' movements. This will be combined with sightings and underwater acoustic monitoring of cetaceans – the collective name for whales, dolphins and porpoises – to gain new insights into how species are affected by ships' movements and noise. AIS – an automatic tracking system that electronically identifies and locates nearby vessels, continuously transmitting details of their identity, position, speed and course – is more commonly used in navigation safety, allowing ships to 'see' each other in all conditions. Dr Conor Ryan, Hebridean Whale and Dolphin Trust Science Officer, said: “This innovative approach provides us with an opportunity to enhance our long-term research, which is providing unprecedented insights into the distribution and range of cetaceans in Scotland's seas, as well as the challenges they face – including the unintentional consequences of human activities. The new AIS transponder on Silurian will also allow closer public engagement with the trust's research expeditions. By using the research vessel's unique Maritime Mobile Service Identity (MMSI) number 232004280, people will be able to follow Silurian's progress around Scotland's west coast in real-time via www.hwdt.org. Equipping Silurian with AIS technology has been made possible by a grant of £94,000 from the UK Government's Coastal Communities Fund. This grant has also funded a major refurbishment of the yacht, including an environmentally friendly and long-lasting copper coating for the hull that will ensure the vessel remains seaworthy for the next decade, alongside other activities. Hebridean Whale and Dolphin Trust – based in Tobermory on the Isle of Mull – is recruiting paying volunteers for its surveys. Between May and October, there will be 12 separate expeditions, each lasting between one and two weeks. This includes two 'Teen Teams' reserved for 16-17 year olds. These volunteers will work and sleep on Silurian, receiving specialist training and working with scientists – conducting visual surveys, acoustic monitoring, and cetacean identification through dorsal fin photography. 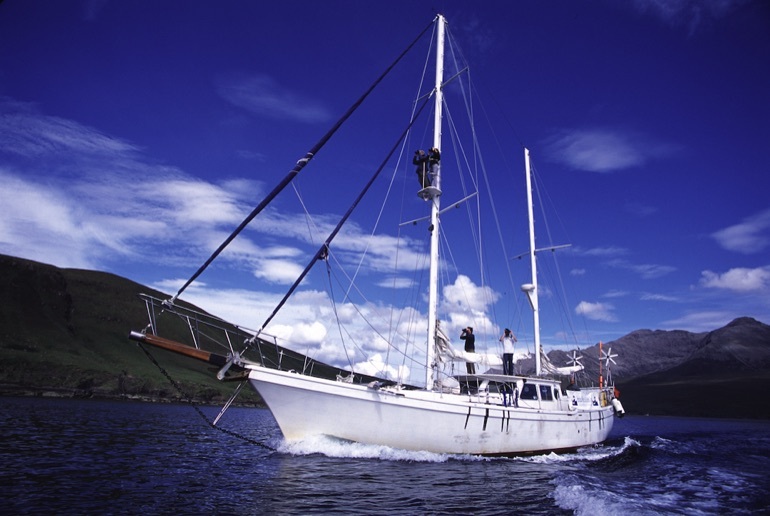 They will also be able to develop sailing and navigation skills as they visit some of Britain's most remote and wild corners. Silurian has been the platform for Hebridean Whale and Dolphin Trust's unique research programme since 2002, welcoming aboard over 60 volunteers annually, surveying tens of thousands of nautical miles and logging every cetacean encounter made. This year, the yacht will welcome her 800th volunteer aboard. The yacht is also used as a floating classroom for marine conservation education for schoolchildren and students. Western Scotland's seas are one of Europe's most important habitats for cetaceans with 24 of the world's estimated 92 cetacean species recorded in the region to date. Many of these are national and international conservation priority species. As well as strengthening knowledge about cetaceans and contributing to recommendations to safeguard them, the trust's surveys are important because cetaceans are apex predators at the top of the marine food web, and so can act as indicators of the marine environment's overall health. Participation costs cover boat expenses, accommodation, training, food and insurance, and support the charity's research. For details, email volunteercoordinator@hwdt.org, call 01688 302620 or visit www.hwdt.org.